← Where Is the Light in Your Life? After months of knitting, I aimed my finished sweater at the trashcan beneath sink. My Grandmother Sonja’s hand on my arm stopped me. It was my first knitting project, a sweater out of off-white fisherman’s yarn, with a plain back and multiple diamonds of different stitches on the front, ribbing at the wrists and around the bottom of the body. I presented it to the family gathered at my grandmother’s house with the delight that comes with a finished project. She and I agreed it was a masterpiece. I had taught myself to knit out of the encyclopedia. No one in our family knitted. We all crocheted. 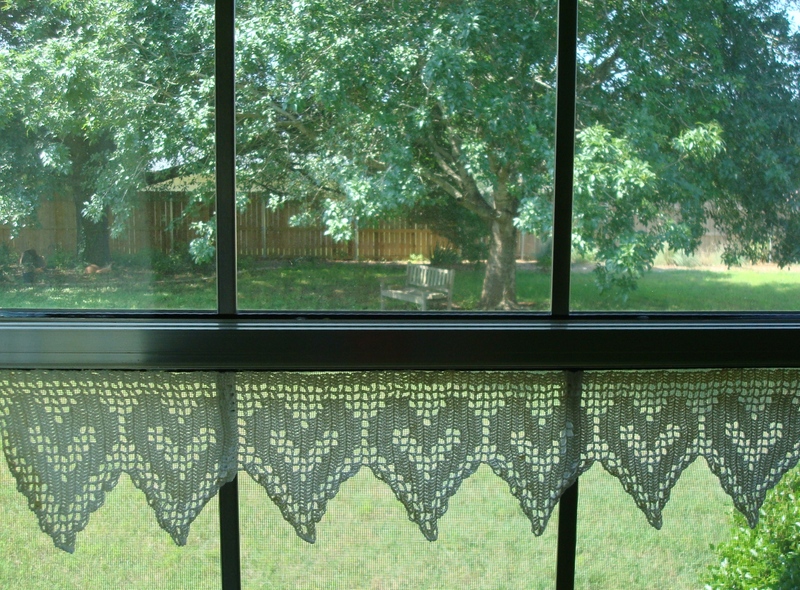 We crocheted doilies, scarves, potholders, baby bonnets, dresses, and booties, fashioned filet crochet for lace and pillow fronts, and pastel granny squares for baby shower gifts, even the filet crochet hearts hanging in my window. We all crocheted. My great-grandmother, Hulda, known to us as Mommie, had started a crocheted bedspread years ago. Mommie had handed over the popcorn squares done in crochet thread to my mother years ago to finish. I enjoyed crochet, but wanted to learn to use two needles and not just the single hook. More patterns were available. I learned about life through books, the birds and the bees, cannibals in South America, tropical diseases and knitting. I learned to knit from the World Book encyclopedia. While I was displaying my sweater to anyone who came near, I met a knitter. She told me the whole sweater was wrong, wrong, wrong. My every purl stitch was twisted, creating a rough texture on the sleeves and back of the sweater. Even the ribbing had twisted stitches. The perfection melted in front of my eyes and I saw it for what it was, a flawed creation. As the woman laughed, I shrank inside, humiliated at the mistake, a mistake that echoed on half the sweater’s stitches. My Grandmother Sonja took the sweater from me, declaring it beautiful, even more beautiful than if knitted conventionally. I could not see it. I left it with her, because it was now an embarrassment, not a masterpiece. And, yet her kindness has stayed with me. She redeemed my mistake. Now, many years later, I see the humor in my sweater knitting, and better than that, I see the amazing love and grace demonstrated by my grandmother. I left it behind deliberately, ashamed of it. These days, I’d show it for what it was, a learning experience and a means of grace and love. There is no perfect offering we can give to ourselves, to loved ones, or to God. Fortunately, perfection is not required. Forgive yourself for being human. This entry was posted in Faith, Forgiveness, Hope, Living Fully, Love, Peace, Wholeness and tagged crochet, faith, family, forgiveness, grace, hope, kindness, knitting, love, mistakes, peace, redemption, wholeness. Bookmark the permalink. Actually, the woman who commented on your knitting all of those years ago was in error. You simply unvented an interesting texture stitch and, when repeated, it became a design element. Rule of thumb: always be suspicious of someone who tels you that your knitting is wrong. I unravel almost as much as I knit but know that you are right — all of those cracks let the light in. I have so many cracks, I have to squint at all of the light. Thanks for this. Thank you, Katherine — and I feel very comfortable with a knitter who is also a designer telling me this. Many blessings. I loved this, Sonja! Such wisdom from your grandmother. My mother was a Real Knitter – she made sweaters and blouses and skirts and coats – all in beautiful colors and patterns, with taffeta linings and exotic buttons. I can make something that is roughly rectangular, in one or two simple stitches. But I was lucky enough to have a mother almost as wise as your grandmother, so I’ve always been able to enjoy the knitting I do for what it is, and not have to agonize (too much!) over what it isn’t. 🙂 Miss you at lectionary and how you’re doing well! Blessings, m.
Dear Mary, what a great mom you had. I miss our lectionary group, too. There is not one up in this area. Hope you are doing well.